The Panasonic P903iX high-speed is compatible with FOMA high-speed to let the user enjoy high-speed packet communications with receiving speeds of up to 3.6 Mbps in FOMA high-speed areas. The P903iX is also equipped with Windows Media Player as well as a Full Browser and the user can enjoy Windows Media Video contents on the Internet. The Panasonic P903iX high-speed handset is compatible with DoCoMo’s new Music Channel service and the user can automatically download music programs of about up to one hour during the late-night hours for listening later. The handset also makes it possible to play entire tunes downloaded with Chaku-Uta Full (Chaku-Uta full” is a registered trademark of Sony Music Entertainment (Japan) Inc) and SD-Audio seamlessly on the same play list with a multi-function music player. The P903iX enables the user to play SD-Audio up to 75 hours and Chaku-Uta Full up to 70 hours with stereo headphones. The P903iX is compatible with 10MB i-motion and the user can download and watch high resolution video clips from i-mode sites. The handset is also compatible with Bluetooth to let the user enjoy listening to music or receive a phone call when it rings wirelessly, using Bluetooth-enabled wireless headphone (sold separately). 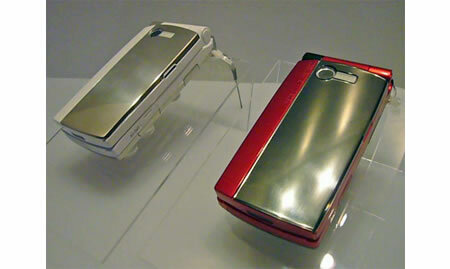 The Panasonic P903iX high-speed handset measures 103 X 51 X 25 mm (when folded) and weighs approximately 126 grams.